So I finally got my latest draft to the beta readers yesterday after seemingly endless tweaking. As long as they don’t hate it, it will just require a final read through in a few weeks and then off to my agent. It’s always odd reaching this stage after months of working on something every day (I started this one in October 2014). My floatiness was short-lived however, as the dread realisation that I now have to tackle the synopsis dragged me back to grim reality. I always think a cover says so much about the quality of the contents, and I have nightmares about having my work featured in a publication with substandard cover art. 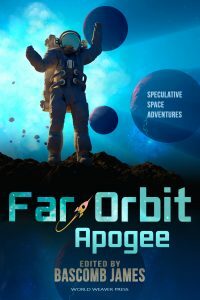 Fortunately I genuinely like the cover of the Far Orbit: Apogee anthology. Here are a few words about the anthology. “Apogee is the second volume in the Far Orbit anthology series edited by Bascomb James. This well-received series features modern science fiction adventures crafted by a new generation of Grand Tradition SF writers. If you wish to pre-order, you can do so at the following sites. The release date is October 13th 2015, and the book is available in trade paperback and ebook formats, from World Weaver Press. The Far Orbit: Apogee anthology is progressing nicely, with a release date of October 13, 2015. The cover reveal is scheduled for Thursday August 13th, 2015, when I will be posting and tweeting cover art and the back cover copy.